CALAMITY JANE (D. Trimmer) Tetraploid (Elisa Dallas x Priscilla’s Smile) 28” E. Re. Ev. 6 ½” You know I really like this one as it is the second cultivar I’ve named after my wife (smile.) Calamity Jane typically produces 30 buds and has 3 lateral branches. 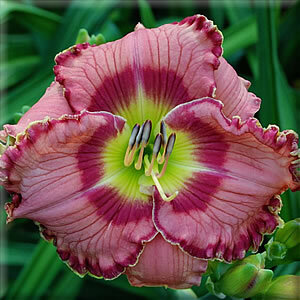 The stunning circular blooms are a dark pink with red eye and edge outlined by a gold outer edge. The throat is large and pale yellow green. Fertile both ways, she was my most heavily used pod parent last year. 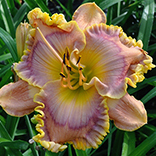 Calamity Jane is a vigorous grower and strong rebloomer. If you’ve liked any of my red eyed pink cultivars in the past you will love this one. She is special!